In the heart of Moscow, on Petrovka Street, LavkaLavka is both the leading champion of Russia’s locavore, farm-to-table movement, and a promoter of new Russian cuisine. It also glorifies a concept applied by many, though seldom so explicitly: selective gastronomic amnesia. We are not trying to recreate 17th century cuisine, although we want to know it and study it in our work. We are imagining that Russia’s 20th century and its gastronomic degradation never happened. We work as if Russian cuisine just naturally evolved over the century [to its present state]. Three commandments on the website’s front page also rehash more or less these same principles: client-controlled quality (i.e., if you don’t like what you eat, you’ll get a refund); only seasonal and local products; and revival of traditional agricultural cultures, crops, and species. And LavkaLavka (lavka means little shop in Russian) is more than a restaurant. It’s an ambitious organic food cooperative, founded by one Boris Akimov in 2009, that organizes tours of farms, runs several stores in which to sell some of its farmers’ products (one of which is adjacent to the restaurant), and publishes a blog. 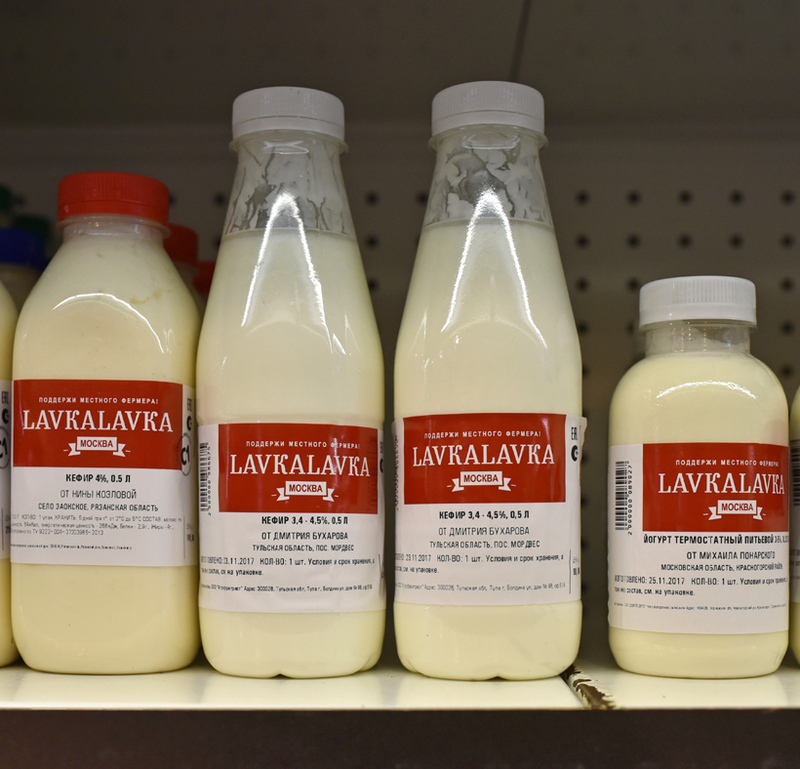 As with some other cases, a turning point in the fate of the whole LavkaLavka project was provided by The Sanctions – shorthand for Putin’s embargo on European and American products that conveniently de-emphasizes Putin’s responsibility. While eating Russian wasn’t the only possible option for locals (food could still be imported from Asia and Africa), it became both one of few remaining choices and a matter of patriotic pride. You can read more about Akimov, The Sanctions, and Russian organic farming in this New York Times article. LavkaLavka also sources from all over Russia. “We are trying to celebrate different areas of Russia, bring the regions to Moscow, to help people know what they have in their own country,” explains Zlatopolskaya. And Boris Akimov apparently puts his money where his mouth is, as shown by the Teriberka: New Life project, started in 2015. The northern village of Teriberka, in the Murmansk area, was used as a setting in the production of Andrei Zvyagintsev’s bleak, award-winning 2014 film Leviathan. In reaction to the discussions and negative image this generated, Akimov decided to create a festival there, for attendees to “fully experience the scale and beauty of the Russian North, see the potential of small regions and understand how it can be used to develop these territories,” with activities organized around themes of gastronomy, tourism, sport, entrepreneurship, art, and culture. Back in Moscow, the chef at the LavkaLavka restaurant, Vladimir Chistyakov, undertook to define a modern Arctic (or at least Northern) cuisine, leveraging the local Murmansk seafood, including chef favorites such as scallops, mussels, and sea urchin. He created an Arctic menu: rye pasta with deer and lingonberry; deer heart with parsnip, rosemary crumble, and lingonberry sorbet; Murmansk cod with scallop tartare and creamy rye sauce; halibut suguday (a sort of local version of fish carpaccio) and lingonberry shanga. In addition to those dishes, Chistyakov served exotic creations at the Teriberka festival proper, including a Murmansk shawarma, with Mexican hot peppers, Uzbek tomatoes, and grilled fish. Today’s food at LavkaLavka reflects all of these elements: evolving Russian cuisine, finding local farmers, growing rare ingredients, celebrating Russian regions (and Crimea), the Teriberka project… It comes as no surprise that nearly every product on the menu lists the name and location of the farmer who produced it. In fact, you’re likely to find pictures of said farmers on the website too (such as here, here, or here). 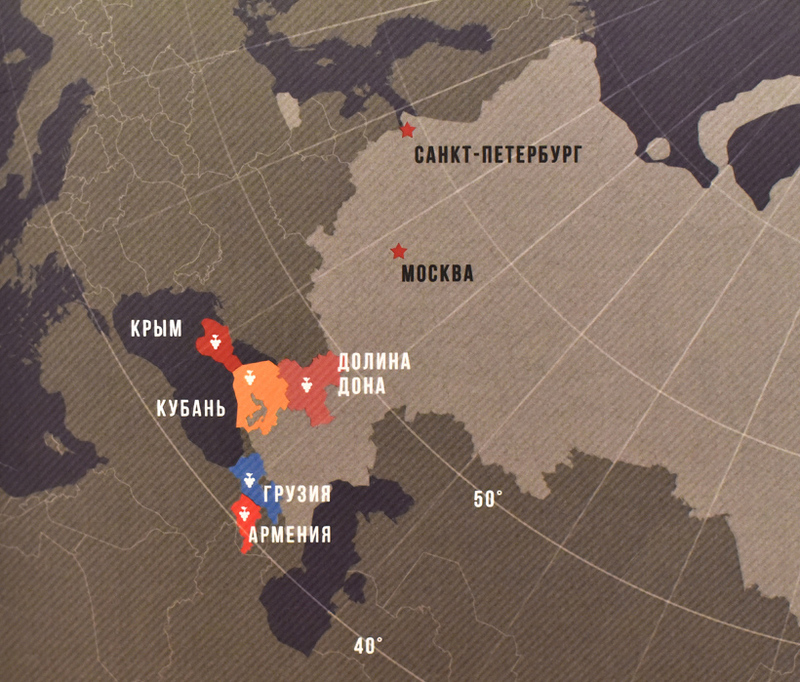 Of course, considering the massive size of Russia, the term “local” is still being used in a watered-down fashion. Moscow-Crimea: 1500 km. Moscow-Teriberka: 2000 km. Warsaw and Budapest are only 1200 km and 1800 km away, respectively, yet I don’t hear the chef waxing lyrical about kielbasa or goose liver (both embargoed anyway). So local mostly means Russian, and everything on the plate is Russian, plus the water (which is pretty rare in Moscow’s high-end restaurants) and most of the wine (the rest of it comes from Georgia and Armenia). For a farm-to-table high-end restaurant, the menu is pretty long – about fifty dishes. There are cold appetizers that let the products shine (assortments of cheeses or prepared fish, terrines and pâtés, tartares, salads), a few creative hot appetizers (warm carrot hummus, duck varenyky, the deer heart from the original Arctic menu), and a handful of very Russian soups. The mains are a somewhat eclectic mix of seafood from all the corners of Russia (from Murmansk cod to Sakhalin scallops), steakhouse classics (ribeye, burgers), game (deer) and pseudo-game (rabbit, duck) meats, and – lo and behold! – vegetarian options (barley risotto, kasha, potatoes). Desserts combine a variety of berries, Russian classics (medovik, zapekanka), and Western imports (éclairs, panna cotta, apple pie). For the record, my visit was in November 2017. The anchovies, quite popular on the Black Sea, are the simplest dish: the small fish are served whole and just slightly brined. The gobies cooked in tomato sauce have a very meaty texture, very different from the other fish in the assortment. The sliced, marinated herring is served with a little brunoise mix of potato, beet, and carrot (a variation on Soviet Russian vinegret). The mackerel is a bit similar to the herring, but diced and served with a simple potato salad. An interesting selection of inexpensive fish that are too often ignored. All four taste very good and do look very pretty. As I’ve noted elsewhere, Crimea was a great investment for Russia’s gastronomy. The beef tartare with smoked cream, kimchi, and bottarga is a bit hard to reconcile on the plate, considering the description on the menu. Smoked cream and bottarga, check – although I could use double the amount of bottarga. I don’t know about the kimchi. On the other hand, I see berries that could be redcurrant, leaves that look like baby Swiss chard, something that I’m gonna call deep-fried shredded cabbage, little white mushrooms sometimes coated in herbs, and toasted black bread. The tartare is hand-cut and the meat is excellent, but despite all the ingredients I’ve just listed that should have added powerful flavors to the dish, the outcome is somewhat plain. And here’s another one, the deer tartare (also hand-cut) with porcini pâté, salt-cured egg yolk, and sprouted alfalfa. All the ingredients are accounted for this time, but I have similar criticism: despite the quality of the meat, this is a bit plain. None of the garnishes are as easy to mix with the meat as you’d expect for a tartare, and the porcini pâté looks and tastes like a mild cream. There are some good ideas in both tartares, but their execution needs some improvement. The halibut in crispy dough with kale and spicy fish bouillon, on the other hand, is perfectly executed. The bouillon is poured, table-side, through the latticed puff pastry and gets completely absorbed by the dough and the fish in a matter of seconds. The result is a dough that’s still crispy on top, and a fish that’s moister than in almost any coulibiac I’ve ever eaten. The excellent bouillon is definitely the secret weapon here, with its very rich vegetable flavor (for a moment I thought there was chicken stock too but I was probably mistaken). The fluffy and crispy puff pastry encases a halibut fillet with just some kale. Kale isn’t really my thing (I’d choose any other kind of cabbage over it), but here it works. There’s also a kale salad on the side, with only salt and unrefined sunflower oil (I think), which is definitely way too much kale for me. The deer leg with red and black rowanberries is prepared like a steak, but unfortunately it’s much too cooked, going on medium well. The berry sauce, though, is a great match, the black rowanberries tasting a bit like blackcurrant. The chef seems to have a particular fondness for sorbets with savory dishes (see the Arctic menu), and here we’re getting a red rowanberry sorbet that’s quite acidic and reminds me of cranberries. I’m not convinced there’s any benefit in serving a frozen dessert with a steak. Enoki mushrooms and alfalfa sprouts complete the dish. The osso buco with pumpkin mousse and wine sauce with dried persimmon is an interesting and successful variation on the Italian classic. The veal is really tasty and tender, and the pumpkin purée unctuous and not too strong. The sauce is very good but you have to be on the lookout for the persimmon in order to properly detect it. I like the unexpected nature of this dish for a Russian menu, and appreciate the clever use of fall produce such as pumpkin and persimmon. The reasonably sized portions should leave you room for dessert. The triple chocolate dessert consists of a brownie with truffle oil, a chocolate sponge, and a homemade chocolate ice cream. There’s also some redcurrant sauce. The presentation is original, but each element is rather mundane. Not bad, but lacking inspiration. I don’t remember tasting any truffle oil, and maybe it’s better that way. The beet panna cotta with blackcurrant ice cream, blackcurrant mousse and beet tuile is much more interesting. It’s a very successful pairing and an original take on common Russian flavors. Everything tastes good, and I can really taste the beet in the panna cotta. I didn’t capture the wine list, but it offers wines from the Don Valley, Kuban, Crimea, Georgia, and Armenia. 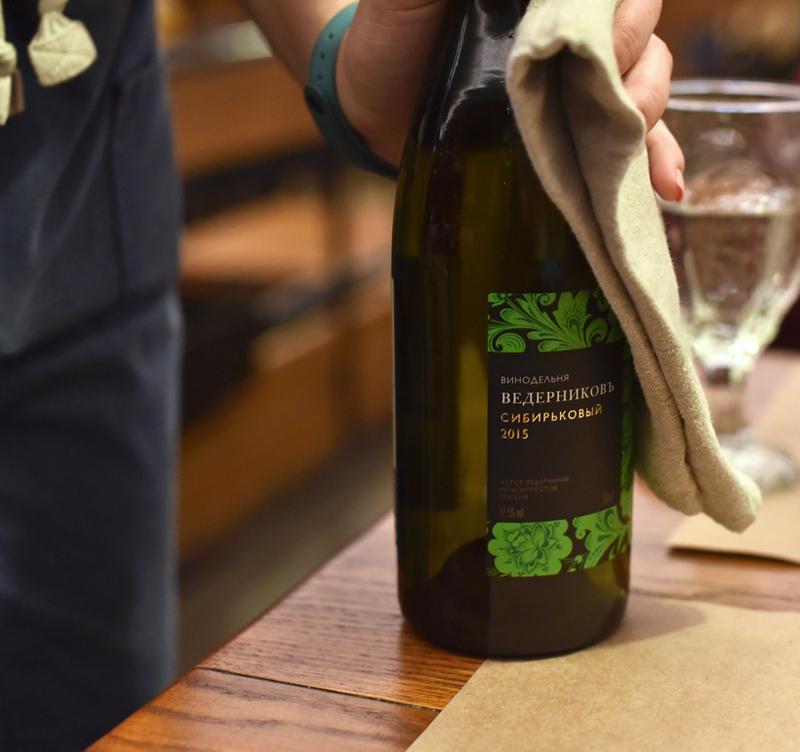 The one bottle we drank,Vedernikov Sibirkovy 2015, made from an indigenous varietal in the Rostov-on-Don region, is an unpretentious white wine that drinks well. It’s quite young, fresh, and a little bit mineral. As for hard liquors, LavkaLavka fully embraces the polugar trend that seems to be taking Moscow by storm for some mysterious reason – in my opinion, polugar is best described as a kind of vile, flavored moonshine sold commercially. You gotta admire how far Russia has come: twenty years ago, people sold bathtub vodka illegally for cheap, today they sell polugar legally at exorbitant prices. You can order a full tasting menu consisting of five small plates (beef tartare, salo mousse, pancakes with fish roe, varenyky, marinated mushrooms), each paired with its very own polugar (juniper, horseradish, buckwheat, honey and pepper, caraway). Aspirin not included. Compared to White Rabbit, the cuisine at LavkaLavka is simpler and more approachable, and the dining room has a much more laid back atmosphere. Instead of taking an elevator to the top floor of a skyscraper, you walk through an archway to the end of a courtyard. Yet both restaurants share many of the same mantras and favor some of the same ingredients: the Russian products, Nordic seafood, game meat, unusual berries… At LavkaLavka, you can also buy some of them to cook at home! While we had issues with the execution of some of the dishes, the menu is filled with good ideas and delicious products, and this is the kind of place where you’d want to come back every season to taste the Chef’s newest creations. To sketch out LavkaLavka’s take on modern, regional, farm-to-table Russian cuisine, I’ve made a list of all the ingredients that were mentioned on the menu, and sorted them by categories. Chistyakov clearly likes root vegetables, game meats, seafood, grains, and onion. (Onion is actually the most frequently mentioned ingredient; how about an onion- or Allium-centric menu in the spring?) A variety of berries also find their way into both savory and sweet dishes.